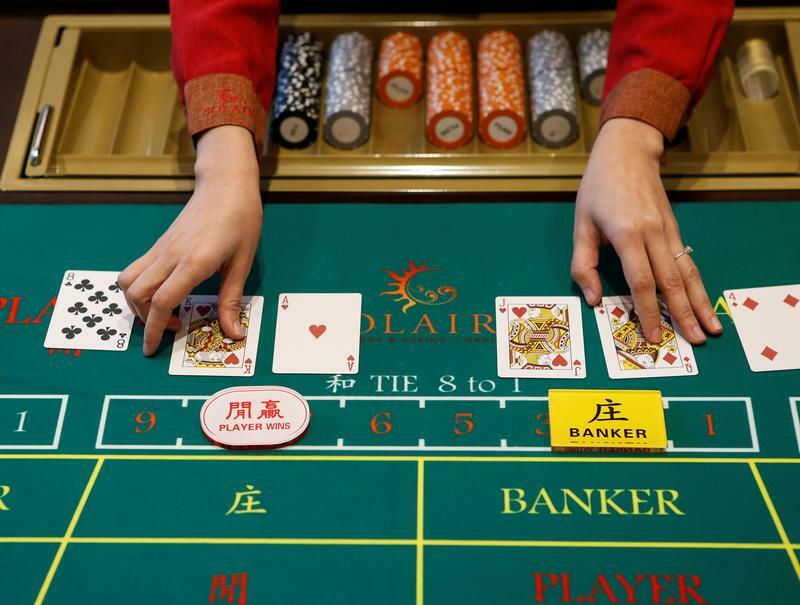 A casino dealer is pictured at a baccarat table at Solaire Casino in Pasay City, Metro Manila March 27, 2015. Japanese gambling tycoon Kazuo Okada asked the Philippine Stock Exchange in a Jan. 11 letter to block the proposed backdoor listing of Universal Entertainment's business in the country, arguing the company has no authority to do so because he is the true owner of controlling shares. Tiger Resort Asia, Universal's subsidiary, agreed to buy a majority stake in a Manila-listed company in September, paving the way for it to trade on the public market. Tiger owns the operator of the $2.4 billion Okada Manila casino resort, which opened in 2017. Universal ousted Okada as chairman the same year and accused him of misappropriating $20 million, which the billionaire denied. A Philippine court on Jan. 6 ordered Okada to be arrested following a recommendation from the country’s Department of Justice that he be arrested on fraud charges. Okada Manila’s gross gaming revenue grew by more than 170 percent, to 27 billion Philippine pesos ($511 million) last year, according to a Citigroup estimate released in January.